In the world of digital media marketing, 3 things are very crucial – traffic, leads and conversion. In order to deliver measurable results, marketing teams run structured campaigns to drive traffic on website which can then be converted into leads and thereafter into final sales. This is a cyclic process and keeps repeating to generate even more traffic for achieving even greater results. That’s where the power of online crowd and conversion rate optimization (CRO) and comes in. In this blog post, we will examine how best you can utilize the power of your traffic to achieve high conversion rates through smart tactics. Herd mentality describes how people get influenced by their peers to do something similar mainly because others are doing it. This is regardless of their independent beliefs and thinking. Marketers however can discover a framework of using this crowd mentality to power outreach and increase impact of marketing campaigns. No doubt, while taking an informed decision, people do seek opinion of others. So, highlighting what people have to say about a service or a product they’ve already experienced can help in influencing prospective buyers. Featuring customer testimonials on your online properties such as website, social media pages etc. can help drive conversions in a big way. Embed online reviews into your social media pages and website. Displaying reviews can boost conversions drastically. It can increase the likelihood of generating qualified leads. 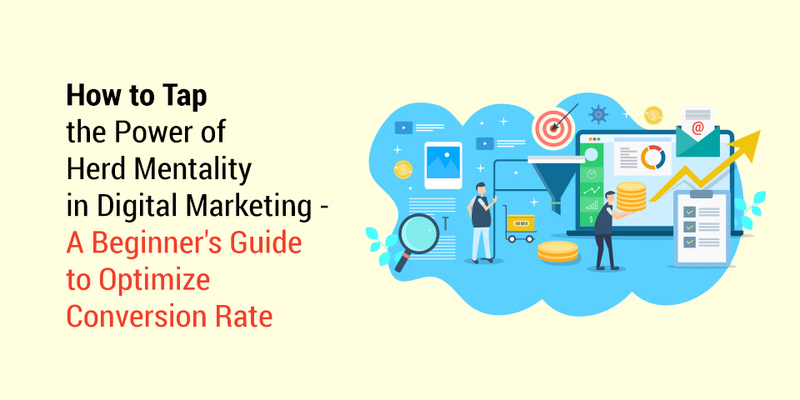 Another useful way to leverage the herd mentality for boosting conversions is by highlighting your customer base in numbers. For example when you say that your college has an alumni base of 8000 plus out of which 1000 are in CXO positions then surely these numbers go a long way to influence more people for making informed purchase decisions. This is a great tactic to establish brand equity in the minds of prospective users of your product or service. This approach will help in building trust with your target audience and will motivate them to consider your brand. When a known figure from any walk of life endorses your academic brand, it builds trust. You should leverage the influential power of your associations and network to enhance brand value. Endorsements can be simply posted on social media. You can use endorsements of industry thought leaders to draw the crowd. The fact that an expert or a leading figure visited your campus or is associated with your Institute, is a powerful factor to pull more people towards your educational brand. Sometimes, in order to create urgency, you can even highlight the number of active users on your site. Similarly, you can show people a notification whenever new users join your social media group. Conversion rate can be optimized by making changes in webpage, landing page, blog etc. CRO increases the chances to convert organic traffic into a lead and finally through some call to action into a customer. Here are a few ideas that can be used to increase conversion rate. Homepage of your website is the most prime property for increasing conversion rate. In addition to providing an overview of the Institute to visitors, the homepage is also the best place to maximize engagement. You can do this by giving links to media releases, offering signups for newsletter or even incorporate online messaging through chatbot for handling applicants’ queries. Blog pages present terrific opportunity for an Institute to drive conversions. In addition to publishing useful and informative content for students, a blog can also be used to drive traffic for generating conversions. This is generally achieved by placing call-to-action (CTA) button in the blog content. Once the reader clicks call to action button, he can be asked to fill lead form which can further be used for running lead nurturing campaigns. Similarly, through this process reader can also be invited to subscribe for a newsletter update. Since the content on the blogging site is highly custom made to generate maximum engagement, it is also likely to give good conversion results. However there is one important point to remember while including a call-to-action (CTA) in your blog post. Mostly websites are overloaded with online banners due to which people ignore them quite often. So it is advisable to use text-based CTA within the blog post. Keep a regular eye on your blogs. Identify the blog posts with high levels of web traffic, but low conversion rates. It may be that the content you are promoting isn’t aligned with the blog post’s content, or your CTA could be unclear. The very basis of designing Microsites and Landing pages is to capture leads and encourage conversions. Landing page content can be optimized in a number of ways such as by embedding relevant video content, images, content previews etc. to encourage users to download it. Conversion rate optimization is a great opportunity for institutional marketers to deliver results by tweaking content. Sometimes, your prospects would want to get connected with your counselling team straight away instead of hovering onto the website or social media pages. You can make it easy for them to take this action by booking a meeting of your prospective applicants with the counsellor. Your counselling representative can give a call, understand the need of the prospect and fix a counselling session – either online or facilitate a visit to the campus. This approach will help in eliminating any possible friction in the overall marketing process and will further help in optimizing conversion rate. By automating the conversion workflows it’s possible to manage omni channel marketing efficiently. You can send emails, fix meetings, nurture leads, chat with website visitors, and manage social media accounts – all at one time and from one place. You should add messaging capabilities to high-performing web pages such as admissions, placements or course specific pages. You can add this feature depending on the engagement level of the visitor. For visitors whose average time spent on your website is on a higher side, they can automatically be offered help by asking for any query that they may have at this point. You can engage your audience for a long time through retargeting by following them even after they have left your website. Quite often people don’t take immediate action you want them to. By leveraging the concept of retargeting or remarketing, you can re-engage people who have left your website. Retargeting works by tracking visitors online and showing your ads as they visit other sites around the web. This is particularly impactful when you retarget people who visit high-converting web pages. How do you intend to use the power of crowd in digital marketing, what CRO strategies does your Institute leverage? You can share it all with us in the comments section below.